This war has begun: Todd Land of Street Life Customs versus Ron Egger of Black Magic Hydraulics. This one-hour series follows the two premier lowrider shops in the country as they compete for the crown of King of the Streets. Todd Land, a big man who founded Street Life Customs in Phoenix, Arizona, employs a supersized team in his quest to have the #1 custom car shop in the world. Todd feels he has an edge, because his city has four professional sports franchises: the Cardinals, the Suns, the Diamondbacks, and the Coyotes. Professional athletes – along with musical artists – are some of the biggest clients for custom rides. Ron Egger, the competition, owns Black Magic Hydraulics in Las Vegas, Nevada, and aims to cast a spell on Todd’s glory. Being in Vegas, Ron rides the constant flow of traffic that hits the strip, as everyone in the lowrider circuit comes to party. But there are custom car events in every major city across America, and both crews know how to get crowds on their feet with excitement. It has become a war that’s waged everyday on a variety of battle fronts. Beating the competition at a sanctioned Lowrider Hop is the most satisfying form of victory. With the crowd watching, all challengers compete against a measuring stick, and when it’s close, the judge’s decision is final. The quality of the restoration is paramount, because if a part breaks, it means instant elimination. From vertical hops, to dancing on four wheels, it’s about finely tuned vehicles operated by masters. Another type of battle is the Shop Call. A competitor can phone and set a meeting, or even show up unannounced. The danger of the Shop Call is that your best cars must be maintained to compete at any time, to keep from getting caught off guard. With pride being involved, and your shop’s reputation on the line, you must accept the challenge. The cars are placed face to face and start hopping at the same time, so that you can visibly see which car gets higher. If both cars are hitting their back bumpers, it comes down to which driver’s car endures the pounding to hop higher, longer. It’s always competition time for Street Life Customs and Black Magic Hydraulics – for business, for trophies, respect, honor, and bragging rights. Which shop stays full of customer’s cars, and who is in demand by the highest profile clientele? As business increases, so does the market for these vintage cars. The shops compete to locate and stock a reserve of cars so they can meet any request and increase their turnaround time. In addition, Todd and Ron are constantly working to grow their street teams. After all, the quantity and caliber of these sponsored cars out in the streets or at competitions is a direct reflection of each shop’s stature. It is an honor to be sponsored by one of these shops, and the street teams take their duty seriously. 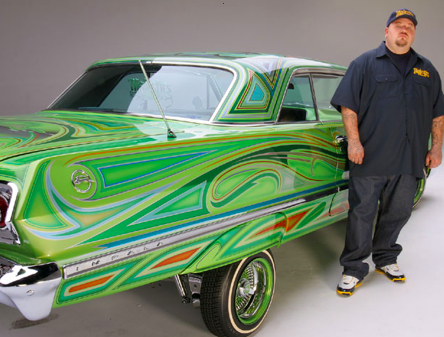 The custom lowrider movement is more than a fad – it’s a phenomenon. Being at the pinnacle of this world is a stressful undertaking. AMERICAN HOPPERS brings you right inside the action – close enough to dodge sparks and smell the paint. Drama unfolds as these charismatic crews race to meet their seemingly impossible deadlines. Will their latest custom cars meet their clients’ expectations? Whose hoppers will place higher at the upcoming competitions? Who will fold under the pressure? 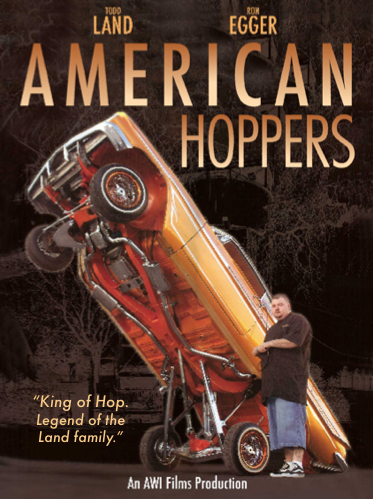 Each week, AMERICAN HOPPERS delivers ticking-clock scenarios, as these rival shops work to complete cutting-edge car restorations, finish their own cars for a show, or get their cars and merchandise trucked to the next custom car convention to do battle before their fans.